The Center for English as a Second Language (CESL) currently offers two language tables to help benefit the educational development of our students while simultaneously supporting the foreign language students at UK. Mrs. Lina Crocker started these events to help students, and she continues to lead them each semester in the Patterson Office Tower. 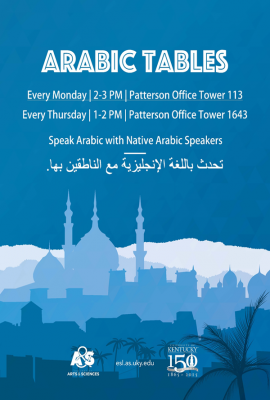 Weekly events were held for both Spanish language students (Intercambios) and the Arabic/Islamic Studies department (Arabic Tables), wherein UK students who are studying these languages and cultures were able to meet with native students in the CESL department. These groups of students gathered together to talk, learn songs, and socialize, allowing them not only to meet new people, but to educate each other in a way that ultimately benefits both parties. These partnerships are just a small portion of learning opportunities organized by Mrs. Lina Crocker. Giving students the opportunity to learn outside of the classroom helps them develop a certain comfort level, both in their language development and in their ability to communicate and socialize with their peers, both within CESL and the University as a whole. 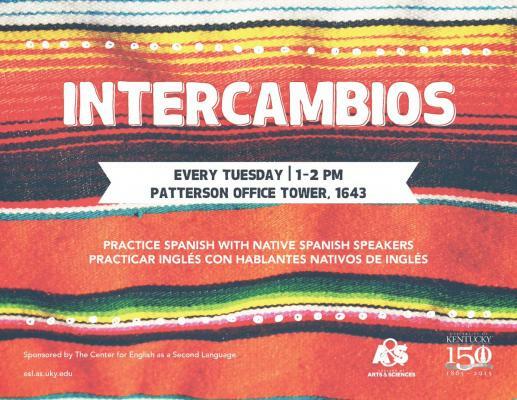 Lina hopes to offer more language options for these kinds of events in the upcoming semesters. To find out more about what the CESL program is up to, Follow ESLatUK on Facebook!